You could build a model with an element for every identifiable loss or gain element, eg every coax connector, every coax adapter. Sure it will work, and it might be more accurate if you have accurate characteristics for all of the elements, but the uncertainty of just a few elements will tend to dominate the overall uncertainty and better to work on getting better accuracy on big-ticket items that including a large number of very small ticket items. For example, if there is 20m of LMR-400 from the transmitter to the LNA, ignore the loss in coax connectors as it will be very small compared to the LMR-400 section and smaller than the uncertainty of your LMR-400 loss estimate anyway. 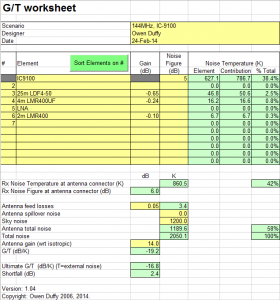 in the absence of receiver measurement, use the receiver specifications. Above is a clip from a spreadsheet model that incorporates the formulas that make calculation of G/T a bit tedious. In this case, the configuration is a very simple one. It comprises a IC-9100 transceiver with LMR-400 feed line to a single Yagi with 14dBi gain. External noise is entered as SkyNoise, and it is taken to be 1200K, a fairly quiet location for terrestrial operations on 144MHz. The calculated G/T is -19.5dB/K, just 2.7dB shy of the ultimate G/T achievable for the given antenna gain and external noise with a lossless / noiseless receiver system. Now everybody knows that better feed line makes a difference. Above is the model changed to include LDF4-50 for most of the run, and some sections of LMR-400 and LMR-400UF around the rotator and to the feed point. This has improved things, G/T is now -19.2dB/K. 0.3dB better so S/N on weak signals will also be 0.3dB better. But note that although feed line loss was reduced by 0.5dB, S/N has improved by only 0.3dB. Looking at the contribution to percentage of total noise, the IC-9100 contributes 38.4% so it is an obvious target for improvement. Lets put a LNA with Gain=25dB and NF=0.8dB right next to the IC-9100. Now that has made a difference, a small difference in absolute terms but a relatively large difference in terms of the 2.4dB shortfall in the previous configuration, we have reduced the shortfall to 0.5dB and improved S/N by 1.9dB. 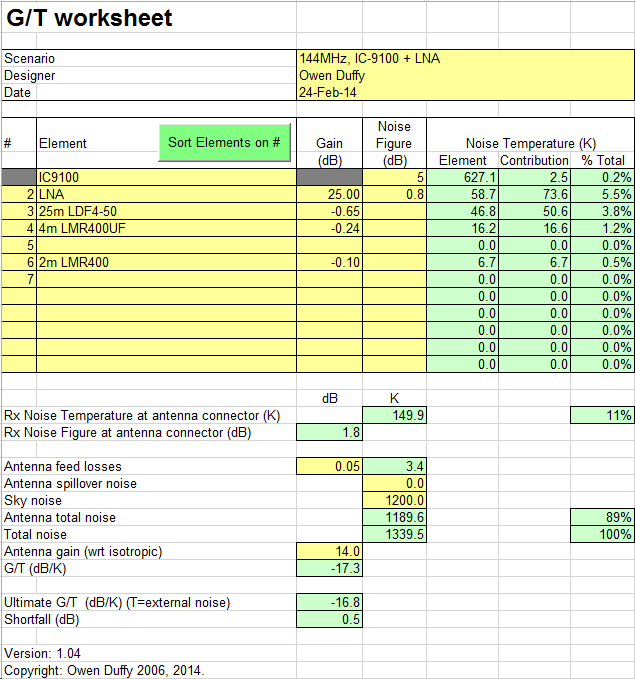 That might seem a small achievement for a 25dB gain, 0.8dB NF LNA… but that is the way it works. So, in pursuit of further improvement, total feed line noise contribution is 5.5% and a target for improvement. Lets relocate the LNA between the main rotator loop and antenna tail. Now we have improved G/T a further 0.2dB. Although the experts would tell you that a masthead LNA is better than a local LNA, and it is, you might question the disadvantages of masthead location against the improvement of just 0.2dB in G/T or S/N in this scenario. But. let’s be obsessive. The largest remaining internal noise contribution is the LNA, let’s replace it with a 0.4dB NF and 18dB gain. Hmmm, that is 0.1dB better G/T although some might view that the new LNA is ‘twice as good’ by specification. The issue now is that the 1.1% contribution of noise on the receiver side of the LNA is now a relatively large part of internal noise, and it can be reduced with more LNA gain… so let’s try a two stage LNA with 0.4dB NF and 33dB gain. Aha, we are within 0.1dB of ultimate for this antenna and external noise, we have won 0.1dB G/T or S/N improvement. This might seem outstanding, it is obsessive, and it is probably a bit dumb as several steps back, we should have considered a better antenna. The models explored above are specific to the scenario modelled, it is unsafe to try to draw generalised conclusions from those results. The models also assume linear systems, systems where IMD effects are insignificant. If you have significant IMD effects, fixing those would usually be the most productive first step. The outcomes for EME scenarios will be different to terrestrial scenarios, different from band to band, different for changed feed line configurations, available components etc. ———. 2006b. Effective use of a Low Noise Amplifier on VHF/UHF. VK1OD.net (offline).